– No flag on Matthews for punching Staley in the helmet. Twice. – Flagging Staley for “retaliation”, when all he did was get in Matthews’ face. – Matthews not being ejected for either the punches to Staley or for launching himself at an out-of-bounds quarterback. The officials certainly mucked things up momentarily, but all this talk about how it “dramatically impacted the outcome of the game” is reaching. If anything, it dramatically impacted THAT drive – the Niners should have had 1st down after Matthews’ dirty play. 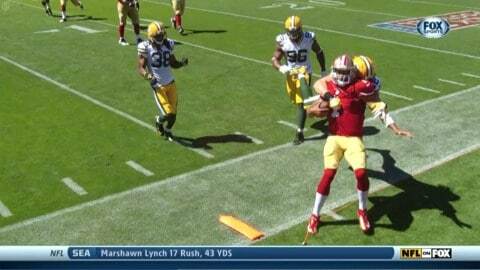 The Niners otherwise completely outplayed Green Bay, but were constantly hampered by the officials’ lack of calling obvious holds or facemask penalties against GB. Please do something to upgrade the officiating of college football games, so far the officiating has been very questionable. A good example is the OU at Oregon game 5 or 6 years ago where the officials very plainly cheated. And, just the other day, the Az. Wis game.